Comparing the pretty picture with the subsequent implementation of the ‘Leyton Links’ plan at this location let’s look more closely at it. The plan promised four things at this site (Leyton High Road at the junction with Sidmouth Road). Only one has been unambiguously implemented (“Footways that are in poor condition will be improved”). 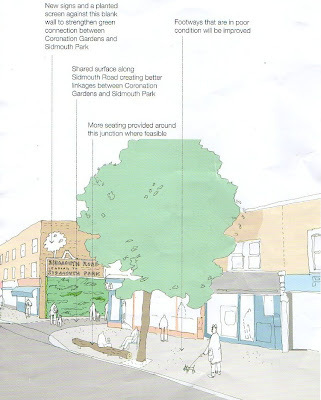 A third promised improvement has been only partly and very inadequately implemented: “Shared surface along Sidmouth Road creating better linkages between Coronation Gardens and Sidmouth Park”. The implementation of this pledge turned out simply to involve putting in dropped kerbs with tactile surfacing for pedestrians on the High Road crossing the junction with Sidmouth Road – something totally at variance with what was promised. The plan talks of a raised table which is the same height as the footway. This has not been done: look carefully and you will see that the table does not reach the height of the footway and leaves a kerb. If you plan on crossing the High Road at this point you are faced by a kerb on each side of the road, something which is entirely at odds with the promise of an at-grade surface. 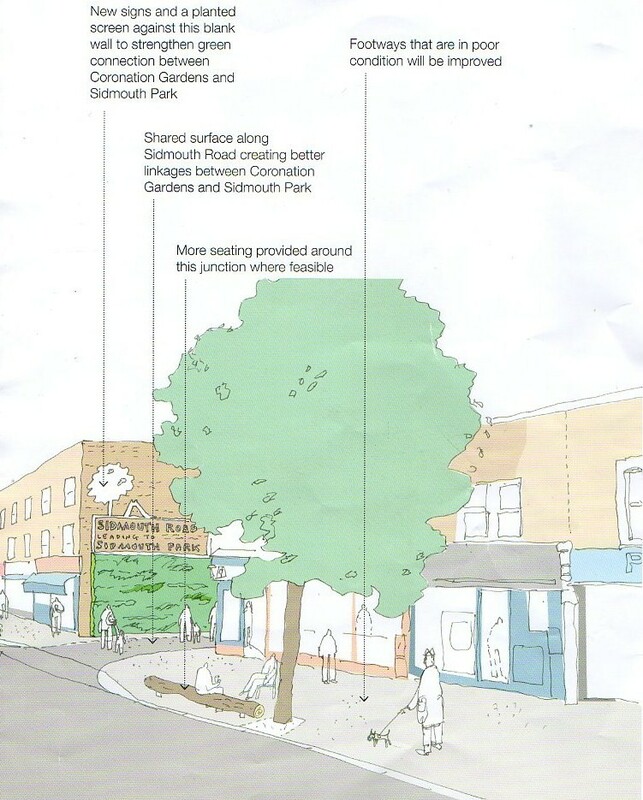 The promise of a “Shared surface along Sidmouth Road” has not been kept: the raised table shown in the plan extends the full length of the street, whereas in reality it fizzles out at the junction, as shown to the left of the photograph below. Finally, the promise of “New signs and a planted screen against this blank wall” has not been kept at all. The brick wall shown below remains bare. The overall plan also shows just one car in the foreground, with fifteen pedestrians. The reality, needless to say, is a little different. 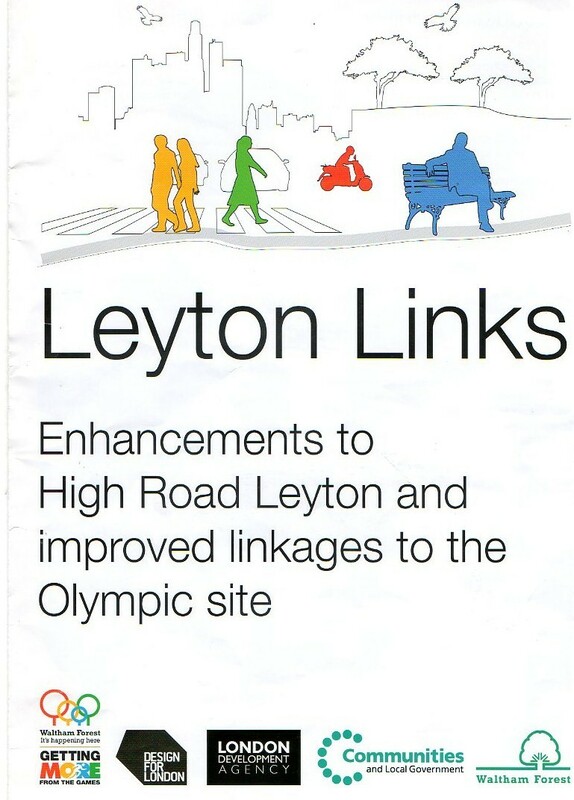 The cover of the Leyton Links brochure does, however, contain one admirable note of realism. It shows no cyclists whatever (the small figure in red portrays someone on a motor scooter). 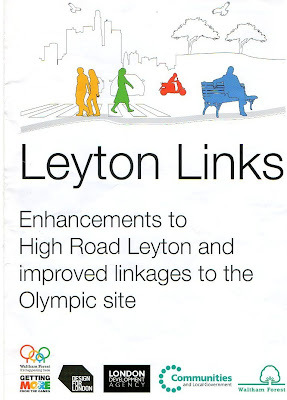 More on how these Olympic funded Leyton Links serve to suppress cycling tomorrow.